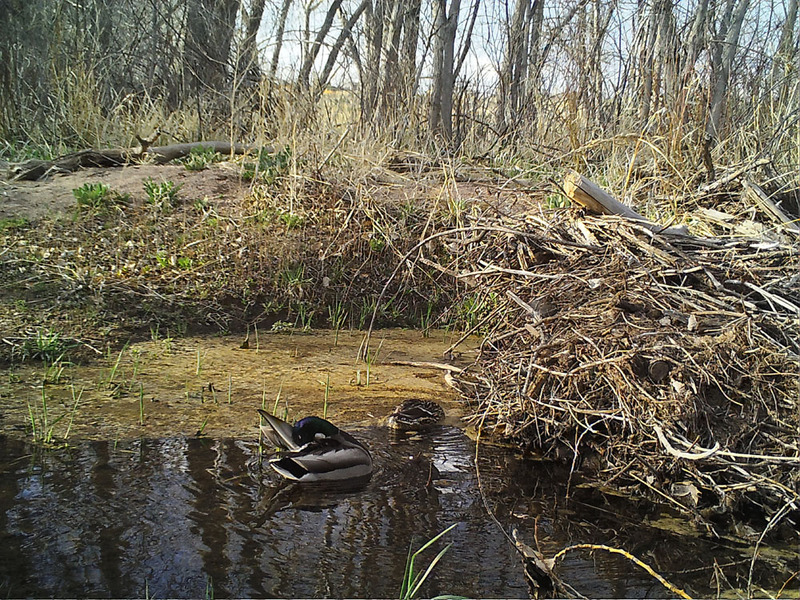 When coming to the Gardens to enjoy springtime blooms, you may be surprised to learn that we also incorporate wildlife observations into some of our research projects. 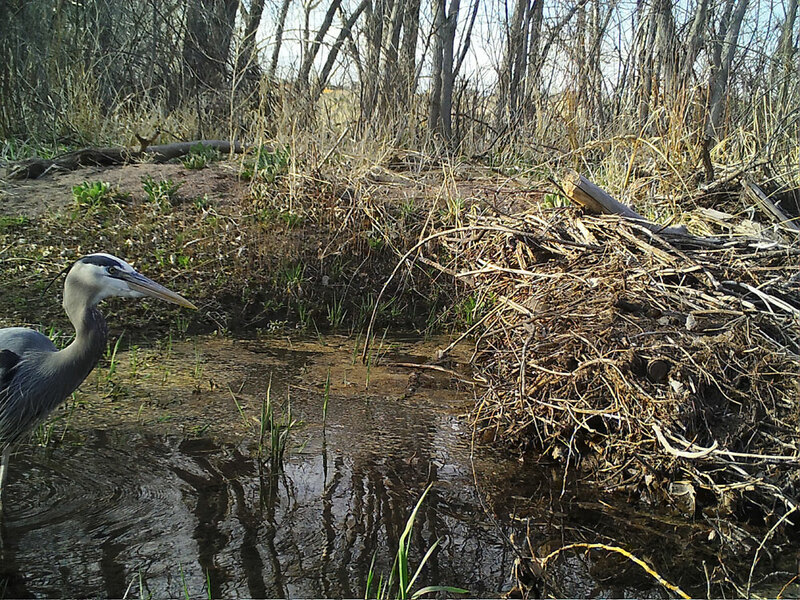 One such research project uses a system of motion-sensing trap cameras strategically placed along Deer Creek at Chatfield Farms to monitor wildlife activity. 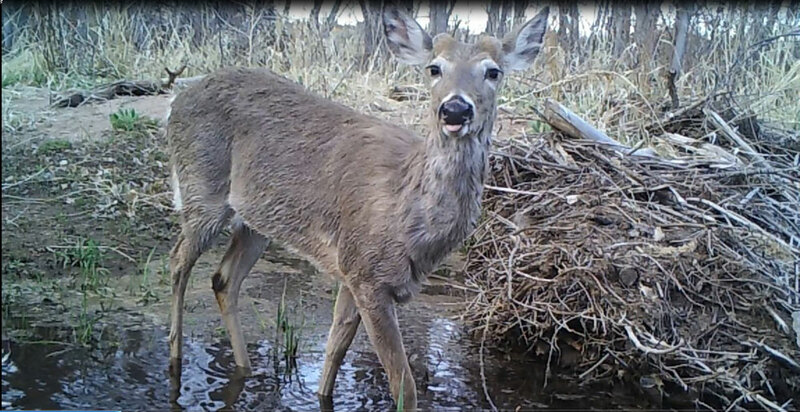 Deer Creek cuts diagonally through the 700 acre property and serves as a hub for many types of wildlife including (but not limited to) deer, beaver, raccoons, waterfowl, coyotes, skunk and even the occasional bobcat. In collecting several years of data, we are now noticing clear patterns in seasons, time of day, creek flow, etc. Under the supervision of Dr. Rebecca Hufft, associate director of applied conservation, I have been managing the trap camera program. Once a month, I make the trip down to Chatfield Farms to service these cameras. This involves swapping out eight batteries per camera (rechargeable, of course) as well as an SD card. With this fresh data in hand, I then make a visit once per week to the York Street location to audit the photos and footage from the previous month’s data. I look forward to these volunteer shifts all week and often reward myself with a walk around the Gardens after I have finished my audit for the day. If you have land and are curious about which critters frequent your property, you can set up your very own trap camera. Many options are available online for under $100, and YouTube provides a number of tutorials on how to set these up and service them. You never know what you may find in your own backyard! Please enjoy some of my favorite gems below. This blog post was written by Christina Brandt, a volunteer in the Research & Conservation Department. Raccoon (Procyon lotor) - Downstream camera - 4/15/2017, 5 a.m.
Coyote (Canis latrans) - Downstream Camera - 7/14/2017, 8 p.m.
North American Beaver (Castor canadensis) - Downstream camera - 6/3/2016, 2:23 a.m.